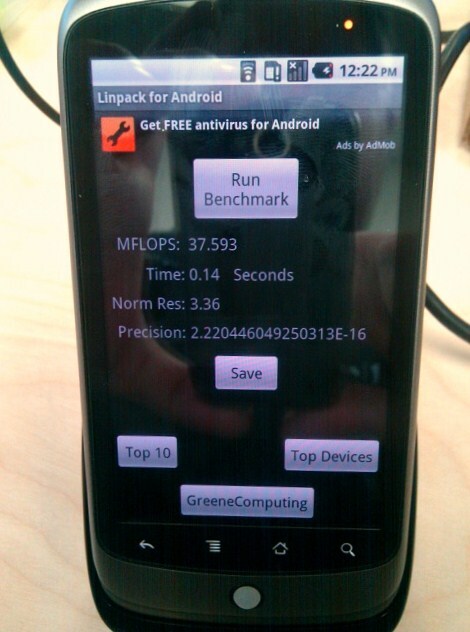 Ian Douglas, a web architect over at Armor Games has managed to get a hold of a Nexus One running Android 2.2 and posted a screenie of a Linpack Benchmark test which shows the device clocking in at 37.593 MFLOPS. What does that mean exactly? That Froyo now includes something, (possibly JIT) which is making the device unbelievably fast. OK, now take a look back to the top of the post and then gather yourself. Yes, it definitely says that Froyo packed in 37.593 MFLOPS. You are speechless right? It was astonishing to see the difference in MFLOPS (Millions of FLOating-Point operations per Second), essentially a high-precision mathematics sequencing instruction set that tests how quickly a CPU can run a known number of calculations. Since Linpack themselves publish a benchmark Top 10 for Android devices, I’m not disclosing anything that hasn’t already been publicly confirmed by others. With the possibility of this newest Android goodness coming next week at Google I/O, the anticipation seems to be building by the hour. Someone please send me their pass.